I have entitled this paper, “In search of a Lost Patron” since, during the over quarter of a century that I have been a member of the Oratory of the Good Shepherd, I have heard hardly anything said about the extraordinary figure under whose patronage the Oratory was placed by our founding fathers over a century ago. He is a figure about whom almost nothing is said any more in this Province, whereas in some other Provinces he is profoundly important. It is almost as if we have become embarrassed by him; or rather of the Cambridge origins of our Society which gave birth to the devotion to him. How did this “loss” come about and what can be said of him in our day to perhaps “rehabilitate” his reputation and, in my opinion, to restore him to his rightful position in the life of the Oratory in this country in our day. So to begin, a little biographical history based in large part on the helpful work done by Canon Patrick Comerford. Nicholas Ferrar (1593-1637) was the guiding light of one of the most remarkable experiments in Christian community living in the history of Anglicanism. An English academic, courtier and businessman, he gave up his successful careers, was ordained a deacon and retreated with his extended family to the manor of Little Gidding in what was then Huntingdonshire, where they lived in community. Nicholas Ferrar was born in London on 22 February 1593 and was baptised five days later. The Ferrar family claimed to be closely related to Robert Ferrar, Bishop of Saint Davids, who was burned at the stake in Carmarthen on 30 March 1555, in the reign of Mary Tudor. Nicholas was the third son and fifth of six children of Nicholas Ferrar and his wife Mary. The Ferrar family was wealthy and was deeply involved in the London Virginia Company, which had a Royal Charter for the plantation of the North American colony of Virginia. Nicholas Ferrar’s niece indeed is said to be the first child to have been named Virginia. His family home was often visited by leading people like Sir Walter Raleigh and Sir Francis Drake. At the age of four, Nicholas Ferrar was sent to school at Enborne, near Newbury, Berkshire, and is said to have been reading perfectly by the age of five. He was confirmed by the Bishop of London, Richard Bancroft (later “Chief overseer of the King James Bible”), in 1598, somehow contriving to have the bishop lay hands on him twice! In 1605, at the age of 13, he entered Clare Hall, now Clare College, Cambridge. He was elected a fellow-commoner at the end of his first year, took his BA in 1610 and was elected a fellow that year. While he was an undergraduate in Cambridge, he first met the priest-poet George Herbert, whose influence in his life would be profound. He probably received the degree MA in Cambridge in 1613, and he may even have been planning an academic career as a Cambridge don. But Nicholas Ferrar’s constitution had been weak since his childhood, and the damp air of the Fens was bad for his health. By the time of his graduation his health had become a cause for serious concern, and he was advised to travel to warmer climate of continental Europe, away from the damp air of Cambridge. In 1613, Ferrar obtained a position in the retinue of the Queen of Bohemia, Princess Elizabeth, daughter of King James I and wife of the Elector Frederick V. He left England in April, but by May he had changed his mind and left Court Life to travel alone. Over the next few years he visited Holland, the German principalities, Austria, Bohemia, Italy and Spain, and learned to speak Dutch, German, Italian and Spanish. He was very much the “Renaissance man”. He studied in Leipzig and in Padua, where he continued his medical studies, and he broadened his religious education through meetings with Anabaptists, Jesuits, Oratorians of St Philip Neri and a number of Continental Jews. During this time, he recorded many adventures in his letters home to his family and friends. Finally in 1618 he is said to have had a vision that he was needed at home, and returned to England. On his return, he was refused a Professorship at Gresham College, London, thus ending any hope of an academic career. Meanwhile, he found that the family fortunes which had been invested primarily in Virginia were faring badly and were under threat. His brother John had become over-extended financially and the Virginia Company was in danger of losing its charter. From 1619, Nicholas devoted much of his energies to the affairs of this troubled Virginia Company. In 1622, he succeeded his elder brother John as the company’s Deputy, becoming responsible for its day-to-day administration. In 1624 twin disasters struck – the company was dissolved and his brother John faced a threat of bankruptcy. In a pamphlet, Sir Thomas Smith’s Misgovernment of the Virginia Company, Ferrar accused Smith and his son-in-law, the Alderman Robert Johnson, of running a company within a company to skim off the profits from the shareholders. The argument ended with the London Virginia Company losing its charter following a court ruling in May 1624. This turn of events convinced Nicholas and the family that they should renounce worldliness by leaving London and devoting themselves to a life of godliness. At the age of 33, Nicholas abandoned his successful political and commercial career to move to found a community of prayer. He retired finally from parliament in 1625 and bought the deserted manor and village of Little Gidding in Huntingdonshire, a few miles off the Great North Road, with the support of his mother, Mary Ferrar, and his brother John. Little Gidding had been deserted since the Black Death in the 14th century. The Ferrar family may well have found Little Gidding through a recommendation from John Williams, Bishop of Lincoln, whose palace was in the nearby village of Buckden. Mary Ferrar and the extended family and household – about 30 to 40 people in all – moved into the manor house, and Nicholas became the leader and spiritual director of the community. This was the only experimental religious community in the Church of England between the Dissolution of the Monasteries under Henry VIII and the revival of religious communities that came about with the Oxford Movement in the 1840s. The household was centred on the Ferrar family: Nicholas’s mother Mary; his brother John Ferrar, his wife Bathsheba and their children; and his sister Susanna, her husband John Collett and their children. They restored the abandoned little Church of Saint John the Evangelist for their use. The household always had someone at prayer and had a regular routine. They read the daily offices of the Book of Common Prayer and also read the complete Psalms each day. Day and night, there was always at least one member of the community kneeling in prayer before the altar so that they might keep the word, “Pray without ceasing”. The community members looked after the health, welfare and education of the local children, and Nicholas and his family produced harmonies of the Gospels. The community wrote books and stories on different aspects of Christian faith and practice, and many members of the family also learned the art of . The poet George Herbert (1593-1633), who had been a contemporary and friend of Nicholas Ferrar at Cambridge, also became a friend of the community. At the time, Herbert was a deacon and held the Prebend of Leighton Bromswold, four or five miles south of Little Gidding. After being ordained priest, Herbert moved to Wiltshire. On his deathbed in 1633, Herbert sent the manuscript of The Temple to Nicholas Ferrar, asking him to publish the poems if he thought they might “turn to the advantage of any dejected poor soul,” but otherwise, to burn them. Ferrar decided to publish them, and within half a century The Temple: Sacred Poems and Private Ejaculations had gone through 13 editions. So it was that Ferrar was personally responsible for preserving some of the best loved and most influential spiritual poetry in the English language. 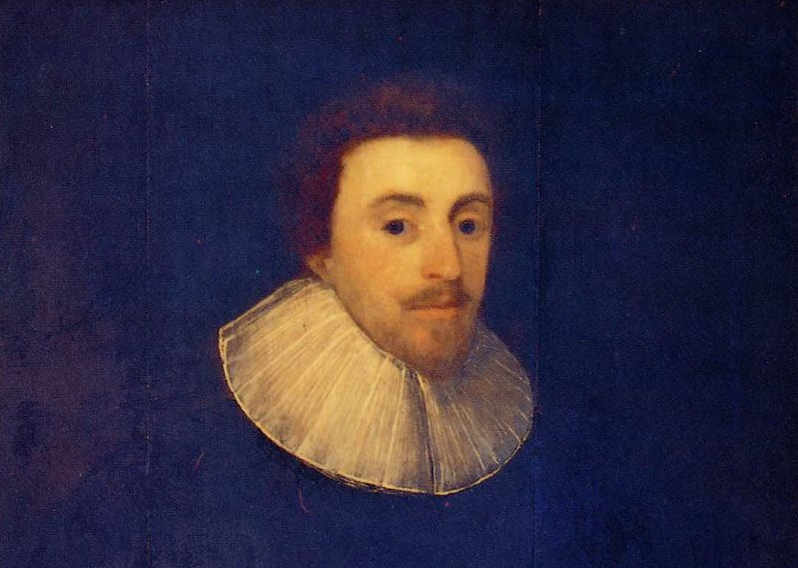 Nicholas Ferrar, who never married, died on 4 December 1637 at the age of just 45. He was buried outside the west door of the church in Little Gidding. His papers are still held at Magdalene College, Cambridge. The leadership of the community at Little Gidding passed to his brother John Ferrar, and the Ferrar family continued its way of life and continued to attract many visitors. During a period of local unrest in the Civil Wars, John Ferrar and some of his family went to Holland in 1643, but they had returned to Little Gidding by 1646. Charles I returned to Little Gidding twice more. Once he came with the Prince of Wales and donated some money he had won from the prince in a game of cards the night before. On his last visit to Little Gidding on 2 May 1646, at the height of the English Civil War, King Charles I briefly took refuge after the Battle of Naseby as he fled north to try to enlist support from the Scots. However, Huntingdonshire was loyal to Oliver Cromwell (1599-1658), who was born in Huntingdon. Cromwell had lived in Huntingdon, and nearby in St Ives and Ely, and was MP first for Huntingdon and then for Cambridge. So it was that the community was forcibly broken up by the Puritan soldiers of Cromwell’s Parliamentary army in 1646, and the brass font from the church was thrown into the pond. The last members of the community, John Ferrar and Susanna Collett, died within a month of each other in 1657. Little Gidding remained the property of the Ferrar family, however, and in 1714 John Ferrar renovated the church, installing wooden panelling and building the “dull façade,” as TS Eliot calls it. TS Eliot honours Nicholas Ferrar in Little Gidding, his fourth poem in the Four Quartets. Early in 1936, on one of his visits to the Society of the Sacred Mission at Kelham, Eliot was asked to read and criticise the manuscript of a verse play written by one of the members of this community, the well- loved Brother George Every. The play, Stalemate – the King at Little Gidding, told the story of King Charles I’s visit in May 1646. Eliot was interested in the idea of Christian Community as the ideal of the Christian life. accompanied by Virginia Woolf’s biographer Bernard Blackstone, a Fellow of Trinity College, Cambridge, whose Ferrar Papers was published 1938. Eliot may also have met Alan Maycock, who was about to publish his famous Life of Nicholas Ferrar. The famous Four Quartets is a sequence of poetic reflections on the importance of time and intersections of timeless moments. After writing The Dry Salvages, Eliot wanted to complete what he now saw as a set of four poems, and quickly settled on Little Gidding, where he found one such “ intersection of the timeless moment” that spring afternoon. The memory of the community survived to inspire and influence later experiments in Christian communal living, even after Little Gidding passed out of the hands of the Ferrar family. The church was restored again in the 19th century. The vandalised font which had been dumped in a nearby pond by Puritans two centuries earlier was also restored to the church. There was a revival of interest in Nicholas Ferrar and Little Gidding in the 19th and 20th centuries, typified by the- much loved in Anglo-Catholic circles of an earlier age- historical novel John Inglesant (1881) by Joseph Henry Shorthouse. The eponymous hero is an Anglican courtier who spends some time at Little Gidding and fights at the battles of Edgehill and Naseby. This once-popular book paints an intimate picture of daily life in the Ferrar family, of personalities, appearances and habits, as well as the daily routine of worship at Little Gidding. Although a work of fiction Shorthouse’s picture is illuminating. The Friends of Little Gidding was founded in 1946 by Alan Maycock (whose seminal biography of Ferrar is still widely available) with the patronage of TS Eliot, to maintain and adorn the church at Little Gidding, and to honour the life of Nicholas Ferrar and his family. Alan Maycock’s own interest in Nicholas Ferrar had been stirred while he was an undergraduate at Clare College, Cambridge. After World War II, Alan and Edith Maycock visited Little Gidding . They found the church in poor condition and in 1946 formed the Friends of Little Gidding, with the Bishop of Ely, our sometime brother and founder, Edward Wynn, as president and TS Eliot as a vice-president. In more recent times, the Community of Christ the Sower, inspired by the example of Nicholas Ferrar, was founded at Little Gidding in the 1970s. The Rev’d Robert van de Weyer, founded a trust in the 1970s to buy the farmhouse for a new community and as a place of retreat. He was the Warden of the Little Gidding Community from 1977 to 1998, The Community of Christ the Sower finally came to an end in 1998 and was known by me in my own undergraduate days in Cambridge. Into this mixture and review of the biographical facts about our patron, of course, comes the Oratory of the Good Shepherd. It must be remembered at this distance of over a century that we were founded not only in 1913 but in the very same week that the ultra- Montane, pro-Roman male Benedictine community at Caldey Island decided to leave to become Roman Catholics. I wish neither to over-stress nor to underplay the influence that event had on the foundation and development of the Oratory in those early years; suffice to say it might have played some part in the very Anglican, “sui generis”, nature of our community at a time when anything remotely Roman was seen as suspect, even in Anglo- Catholic circles. As has been said in my paper on The Revival of the Religious in our Church, few events in the history of the Catholic revival in the Church of England had such seismic effect on the Church as a whole and still had a strong influence on bishops suspicious of anything “catholic” for many years to come. Its effect now has been lost as other events in Europe were to overtake this last just a year later; but it is said that Lord Halifax (the then acknowledged lay leader of the movement) never fully recovered from the shock. Was it possible that the Church of England was not able to find an honoured place for the Religious Life? Into this crisis the Oratory emerged; small, discrete, under-stated and, may I say, very English! The Founding Fathers looked (officially anyway) to no specific pre-Reformation precedent for our life and for those who have spent a century or more debating one, the search is surely in vain! It may be rather unfashionable in some quarters within the Oratory of our day to look back at our origins, but it remains a simple fact that they chose a very Anglican figure in Blessed Nicholas Ferrar to be our Patron. In her recent book, The Web of Friendship: Nicholas Ferrar and Little Gidding, Joyce Ransome shows how the search for community was central to Ferrar’s life, and this becomes the unifying theme around which she has constructed her biographical account. Indeed she shows how far Ferrar transformed his once wealthy mercantile family into a religious and educational community, a voluntary society that he hoped would preach to contemporaries by their example. While that hope was at best only partially fulfilled in his lifetime, those who had known him at Little Gidding were able later to form networks that adapted that piety to create societies acceptable within the church. These men and women led the way to a voluntary Anglicanism that characterized a ‘Church of England’ in transition from a national to an established but essentially voluntary institution. This is the man whom our founders chose to be their Patron and whose memory, certainly in the European Province, has been gently erased (or even air-bushed out) and certainly rather down played throughout all of my time in the Oratory. The reasons for this are complex and varied but perhaps should be rehearsed, if only to contrast the positive devotion of some of the other Provinces with the general indifference of our own. Perhaps he was just too connected with a Cambridge past which can still remain an embarrassment for some. Perhaps he became the victim of that desire, of which I spoke earlier, to find a precedent for our life in a Roman model (we are not, of course, Oratorians of St Philip Neri and never could be since they are seculars). Perhaps he was just “too Anglican” at a time when some where looking for a certainty following another Pole Star (Rome). Perhaps just too little emphasis was placed on him when newer brethren joined in the past thirty years and so his patronage (and even his story) was allowed to fade. In Henry Brandreth’s early History of the Oratory he claims, “The three (founding) brethren arrived quickly at the dedication to the Good Shepherd, but it took longer to arrive at the word “Oratory”. Its adoption was due to Eric Milner-White, who not only had a great knowledge of the French Oratory of Cardinal de Berulle, but was able to take the brethren back further to an earlier Oratory for their ideal, the Oratorio del Divino Amore founded in Rome in 1516 … This was the inspiration, though not the model, of the brethren, and they pretended no kinship either with that Oratory, or with St. Philip Neri’s or de Berulle’s later foundations; though it is interesting that in the library that the Cambridge Oratory House (inherited from Saint Anselm’s House) there was a copy of Saint Philip’s Rule”. He goes on to say, “Eric Milner-White had also been studying the life of Nicholas Ferrar of Little Gidding, who may be regarded as the precursor of the modern religious life in the Church of England. In December, 1913, the brethren went for some ten days of common life at the farm at Little Gidding, and held their services in Nicholas Ferrar’s little church. The rudiments of a constitution were drawn up at this time, which came to be known among the early brethren as “the Provisions of Little Gidding”. The Oratory has always had an especial devotion to Nicholas Ferrar, commemorates him annually on December 4th, the day of his death, and honours him as patron of the Society. It is fitting that the statue of him which once stood in the chapel of the Oratory House in Cambridge is to be placed in the new church of Nicholas Ferrar on the Arbury Road Estate, Cambridge, in a parish staffed by members of the Oratory. There was perhaps a prophecy in the official Court Circular the day after the foundation stone of this church had been laid by the Princess Margaret, when it referred to the “Church of Saint Nicholas Ferrar”. Further to this, our Australian brother, Ron Henderson, said in the more recent history of the Oratory by George Tibbats, “It should be said also that we have never claimed a particular kinship with Saint Philip Neri. Saint Philip, citizen of decadent Rome, striding its thoroughfares, washing the feet of the pilgrims and nursing their sick, leading his young followers on all-night peregrinations and vigils, teaching them and hearing their confessions, he of the miraculous inner warmth; he was not chosen or commemorated as patron by the brethren of our society. We tell rather the story of a scholarly celibate gentleman who retires with his family to a country manor, who orders the details of his community with a strict and regular asceticism, following the formularies of the Book of Common Prayer, obedient to his bishop and his king. But he was also keen to preserve and explore the Catholic heritage of community life, the daily offices of prayer, and praise, the pattern of Benedictine work and prayer, rooted in the psalms and the gospels. in holding these together he was recovering and preserving what he called, ‘The right good old way’”. example meant so much to our founders. Now that the debate is finally over about how (or if) our Anglican Church can declare someone a “Saint” he has, at last, been “raised to the altars” in all the Provinces in which the Oratory Brethren live and work (ours typically being the last!). Common acclaim (the ancient way to canonisation) seems to have won the day; and so it is that The Feast of Nicholas Ferrar is celebrated on 1 or 4 December in the calendar of many provinces of the Anglican Communion, although, in typically Anglican fashion, there is no general consensus on the actual date! So perhaps we are now free, at last, especially in this Province, to rejoice in his prayers; to shake off any residual reticence about our Cambridge past and to embrace the essential Anglicanism and example of the one whom our founders chose to give us as our Patron. Indeed where would Anglicanism have been in its Liturgical life if his greatest Oratory devotee, Eric Milner-Milne, had not so greatly blessed our Patrimony. May this year’s Nicholas Ferrar Day give each of a chance to reclaim him again as our own and to recognise in him one whose short-lived experiment in Community life at Little Gidding so long ago gave the Church of England the courage to accept that religious life had and still has a valued place in Anglicanism. You died the hour you used to rise for prayer. Up to the door where Love will bid you welcome. We greet you at the very gate of Heaven.